Not many know the insides and outs of Little Bellas like Anna Singer. 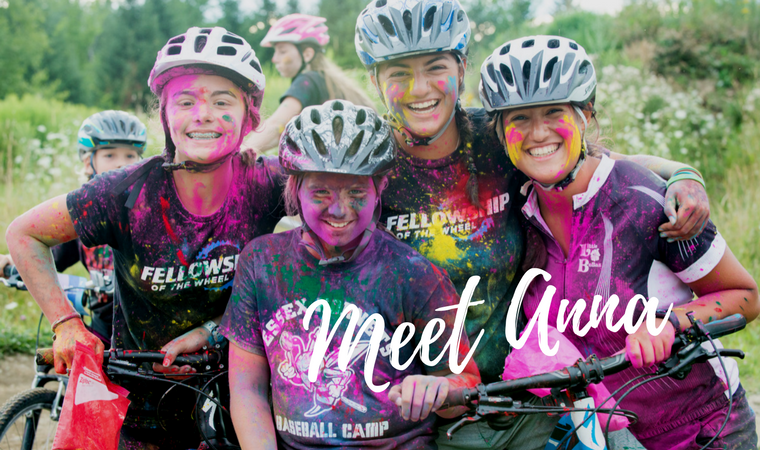 Anna, one of the original Little Bellas in the inaugural program ten years ago, will join the ranks as a Mentor this summer and come full circle with the program. We asked Anna to reflect on her most memorable moment in Little Bellas. She fondly recalls a bout of tears stemming from fear. Fear from lack of confidence and fear from being amongst strangers, left Anna paralyzed and unable to join the start line. These tears were chased away by Sabra who not only projected a vote of confidence but who also commissioned a pro to ride with Anna for the length of the entire course. This moment made a considerable impact on Anna’s life. Though it’s impossible to take any credit for the brilliance that Anna exudes, Little Bellas was the subject of her college application essay that has earned her admission to seven Common Application schools. As I fly through the air I yell “I’m O.K,” a tactic I use to prepare myself for a hard fall. 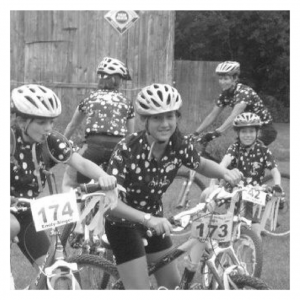 Throughout the summer I volunteer as a mentor with Little Bella’s, a program helping young women realize their potential on and off their mountain bikes. I’ve dedicated myself to this program because I have seen the impact it can have on an individual- including me. After spending 10 years on these trails, I am able to navigate them with ease and control. This, however, was not always the case. I was once one of the more timid girls. During my first race I stood at the base of Mount Snow, tears rolling down my face, thinking there was no way I could complete the task ahead. I went through a list of all the obstacles I faced, coming to the conclusion that I was simply not good enough. I did not belong. It was my mentors who helped me to believe in myself so that I could pick myself up when I fell. They helped me to reach a potential I did not see in myself. I kept pushing myself to be better and better. Now as a mentor, I am able to give girls that confidence and encouragement my mentors once gave to me. I realize that there will always be difficulties to overcome. This lesson is always with me on one particular trail. A large, slippery boulder among smaller rocks marks the location. I used to walk through the rocky section to avoid any damage, but now I’m expected to teach others how to ride through it. As I teach them, anxieties cloud my mind: “What if I fall? Will they trust me?” and so I take a deep breath. If I fall it is okay. Hey, even Olympians fall sometimes. So, I remind them to hover over the bike seat, keep their feet at 3 o’clock and 9 o’clock, no matter how scared they are. I stand to spot them so the girls can navigate the area safely. One by one they travel through the rocky terrain. As one girl descends, she loses her balance and tumbles into me. Remaining calm I explain to her that becoming a true mountain biker means falling down a few times. When I ask her if she wants to try again, she hesitates but eventually agrees, hopping back on her bike. This time she makes it over the rock and flashes a proud grin to me. It is in these moments I realize that I was once that girl. Little Bella’s has taught me what it means to grow from a student to a mentor, but also what it means to be an adult. Life is not going to be easy and there will be times I will want to give up, but I know I have to push forward. Whether you gather strength from watching your role models or by being a role model, perseverance is key. • Be yourself, no one here is going to judge you on your personality or your riding skills, and be yourself no matter if you are with Little Bellas or not! From our perspective, however, we have watched Anna grow up and develop into an incredible woman. To have a girl who not only participates in the program, but asks for more is, at best, rare. Her desire to give back as a mentor has set a precedent. We have no doubts this is the first of many milestones Anna will make in life.